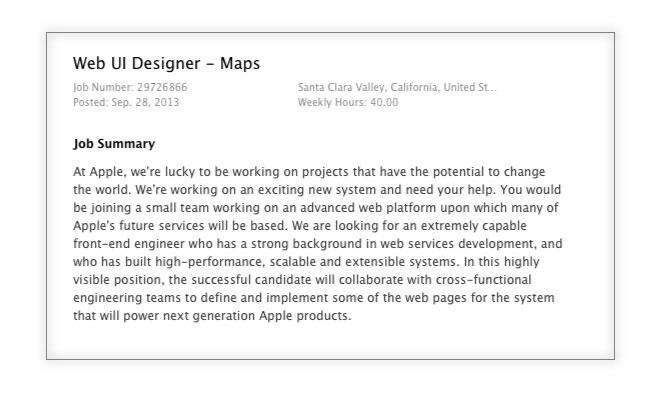 A job listing appeared on Apple's careers site Friday seeking a frontend Web designer and developer for 'a new secret project' tied to the company's mapping systems and services. The new product may not be customer facing, given the listing's specific mention of developing a "platform." Apple has been actively expanding and improving their mapping services of late, recently acquiring transit directions startups Embark and HopStop, while bringing Maps to the desktop in OS X 10.9 Mavericks. While mere speculation, the job posting could signal Apple's intent to expand the Maps platform beyond its own devices by creating a Web portal or service accessible through a regular browser. This could extend Maps' reach and represent an interesting opportunity for developers looking to incorporate mapping data into their websites or apps. Apple Maps debuted to a famously poor reaction in iOS 6, despite the team's apparently impressive array of talent and technology following Apple's acquisitions of companies like Placebase and C3 Technologies. The rollout was so bad that Apple CEO Tim Cook penned a personal apology to customers, and the debacle ultimately cost then-iOS chief Scott Forstall his job.